I have fallen in love… with . I saw them on last week and knew I had to try the recipe. I printed out the recipe and left it lying out on the countertop when I left my sister to babysit last week. She took the hint and when I came back home the delicious smell of fresh-baked apple pie was wafting through our home. Please tell me the serving size is three, because you can’t just eat one of these. Er, at least I certainly can’t! My favorite part? You can make them and then bake half and stick the rest of the unbaked ones in the freezer. We did that and the ones out of the freezer are just as wonderful as fresh-baked. I made these too, only using pears I had frozen from our tree. So, so good, and as Laura points out, much healthier than many things we call “breakfast”! I cannot wait to try these. Thank you for sharing, Crystal! Many blessings! I really like your sister! Me too! 🙂 She’s amazing and wonderful–and I’m so thankful we live in the same town again. I don’t know about the pies, but I sure like your sister! What a treasure God has given you! I made these this past week – and they were FABULOUS. I did over freeze them, so to loosen them I put the muffin tin in a pan of water and in about 10 seconds they popped out so I could put them in bags and freeze them for the long haul. We ate some the next day – and they were great!! 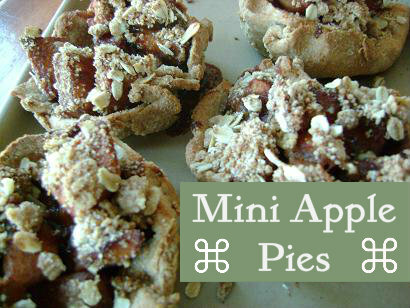 Mini apple pies are my 10 year old son’s go-to treat to bring to school for his birthday! I’ve had to make them for him 3 years running now. I love them so much, I also wrote a blog post about them! I made this recipe this morning for Bible study. Instead of mini pies, I made a whole pie (I had a pie crust in my freezer and limited time) and everyone loved it!